Director, producer, and pro-right activist Vivek Agnihotri is known to experiment with different genres of filmmaking. He has ventured into erotica, thriller, sports, political dramas and has helmed films like Chocolate, Dhan Dhana Dhan Goal, Hate Story, Buddha in a Traffic Jam, none of which made much of an impact at the box office. Perhaps it was the activist in him that pushed him to make The Tashkent Files which is slated to release on today (12 April). 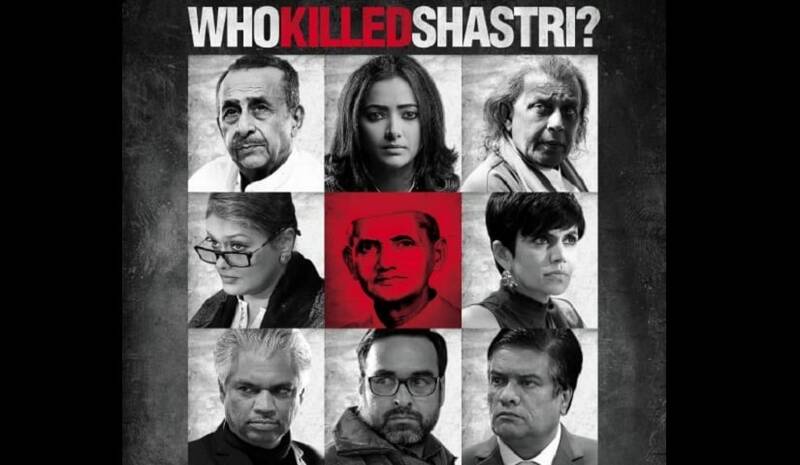 Based on the ‘mysterious’ death of India’s second prime minister Lal Bahadur Shastri in Tashkent (formerly a part of USSR, now Uzbekistan) in 1966, the film explores a possible conspiracy behind the death and claims to uncover the truth. “A few years back on Gandhi Jayanti, I was flipping through some newspapers and saw an umpteen number of articles and ads on Mahatma Gandhi. Turning to my son, I quizzed him about Shastri ji and I got a blank reaction. ‘Who Shastri?’ he asked. Out of frustration, I tweeted saying, ‘Don’t forget, today is also Shastri ji’s birthday and hundreds of people started asking me to make a film on him,” says the director, who shortly announced on social media that he would make a film on the "truth of the biggest cover-up of free India". While official reports claim that the former prime minister died of a heart attack, several conspiracy theories suggest that Shastri was poisoned. The theories are bolstered by the fact that his personal physician, who said that Shastri had no signs of heart trouble before, was killed in a road accident shortly after his death. “I have covered all possible angles and theories. The film is written in the style of a courtroom drama, where the audience is the judge and they are presented with both sides of the argument,” says the director. “Once I found out that there was meat in the story, like a typical corrupt Bollywood filmmaker I decided to exploit it. After some research I realised that there were so many loopholes in it and yet for 53 years nobody ever thought about it. I wanted to do an authenticated research if I had to make the film. So I became a whistle-blower for a year and filed lots of RTIs to the PMO, the Foreign Ministry and the Home Ministry. The responses were similar: there is no document available on Shastri ji’s death,” he says. Since Agnihotri didn’t have much research material, he released a video saying that he wanted to crowd-source it. “And thousands of people started sending me links, books, and contacts. Nobody in the history of India or probably in the world over has ever researched like this. This has given me hope that in the absence of material, you can always turn to the public because people have information,” he says. While the director doesn’t want to reveal what came out of the crowd-sourced exercise, he says he’s left shaken thinking about how the former prime minister’s family was denied the right to conduct an autopsy. “I can’t talk about our findings. For that you will have to watch the film. But one thing which scared me was that tomorrow if any relative of yours goes out of the country and dies in a suspicious manner, and despite repeated requests you are denied the right to conduct the postmortem, there wouldn't be anything more tragic,” he says. By his own admission, Agnihotri's film is the "most apolitical film on a political figure". However, one of Shastri's grandsons has already sent him a legal notice seeking a stay on his film, questioning the timing of the film's release which clashes with the first phase of the 2019 Lok Sabha elections beginning on 11 April. So will it be fair to call the film anti-Congress propaganda? “What has my film got to do with elections? My film is not going to benefit anybody. The only people who will benefit from the film is Congress because Shastri ji was a Congress leader but the irony is that it is the Congress workers who are threatening me. They are making my life miserable. I would only say that only an idiot or a guilty party would to be scared of this. They haven't given a reason to their threats,” he said. Agnihotri took about four years to complete the film that features Naseeruddin Shah, Pallavi Joshi, Shweta Basu Prasad, Pankaj Tripathi, Mithun Chakraborty and Vinay Pathak in pivotal roles. While there were plans of casting Ratna Pathak Shah, Agnihotri convinced his wife Pallavi Joshi to play the part of an older woman, a historian in this fictional story based on facts.“I got very excited and painted my hair white for the film. So the optics of the character finally fell in place, but to play a nasty woman was a difficult decision for me because I have this habit of smiling all the time. You wake me in the middle of the night and I will probably wake up with a smile. My character is very nawabi and privileged,” says Joshi. “It is the role of a historian. She is an author and has written books on Shastri ji. It is her theory that he died of a heart attack,” added the actress. National Award-winning actress, Shweta Basu Prasad, who’s also a journalist and documentary filmmaker plays a journalist in the film too. “Mine is a strong character in this political drama. She starts off as a rookie reporter, writing scandalous, fake stories and eye-ball grabbing headlines and uses it as a stepping stone but when she finds the Tashkent File and discovers what happened to Shastri ji, she gets obsessed with unveiling the truth,” said Prasad. “I said 'yes' to the film because of its uniqueness. There is a dearth of political dramas in India. And because I have that journalistic bent, it helped me play the part. Reading the script was quite a revelation,” she added. The Tashkent Files is Prasad’s third film with Naseeruddin Shah after Iqbal, and the short film, Interior Café Night, and it's her second with Mithun. Prasad worked with Mithun over a decade ago in a Bengali film called, Ek Nadir Galpo: Tale of a River. “Tashkent reminded me of films like Aandhi, Roja, Maachis, and Nayak in which Anil Kapoor played a journalist and later became a politician,” says Prasad, whose next is Jamun with Raghubir Yadav. “It is a father- daughter story. My character is slightly disabled and the film is a social commentary on how we perceive beauty. Cinema is evolving and it is the best time to be an actor,” says Prasad.